The Columbian: Where does our Styrofoam go? Where does our Styrofoam go? 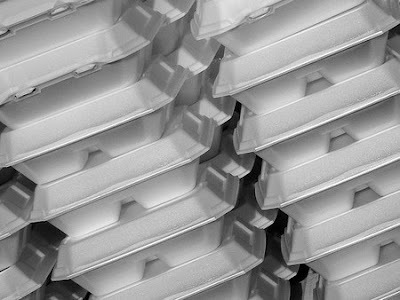 Styrofoam is a trademark of the plastic called expanded polystyrene. Widely used for decades, it does not absorb water easily, get damage from bacteria or mold and is lightweight. However, Styrofoam has become an environmental issue because it is impossible to recycle. Columbia College’s students use hundreds of disposable products each day in the form of Styrofoam to-go boxes. After students use the Styrofoam boxes, they go into the trash bin. Although the boxes may seem convenient for students who have class during meal times, it is important to understand how harmful Styrofoam is for the environment. In Dulany Cafeteria, where most students eat every day, to-go boxes are always available at the entrance. According to Mark Althaus, director of Dulany Cafeteria, students use approximately 150 Styrofoam boxes every day. Each of these students might use just one to-go box. But with 150 students using a Styrofoam box each day, the amount of Styrofoam waste quickly multiplies to 1,000 boxes in a week and 4,000 in a month. If people use Styrofoam to-go boxes without any thought of their impact on the environment, they will be living with massive amounts of waste. People need to know about the seriousness of the environmental problems caused by Styrofoam use. The Styrofoam boxes take 500 years to decompose under the soil. Cynthia Mitchell, superintendent of Columbia landfill and recovery, said that the Styrofoam goes into the ground because it cannot be recycled. ﻿﻿﻿﻿﻿﻿The management at the Columbia College cafeteria recognizes this problem and has made an effort to reduce the amount of disposable products on campus by not providing Styrofoam cups since last semester. According to Althaus, the school cafeteria also has removed Styrofoam cups from the Cougar Café. However, Althaus says the most eco-friendly choice is to eat in the dining hall instead of taking to-go boxes. Although to-go boxes are convenient for students, there are ways to reduce waste that can’t be recycled. Two options are eating meals in the cafeteria and bringing your own recyclable or reusable lunch box to take food to your dorm. It is time to make efforts to save our earth.